If you or someone you care about has been arrested, there is a lot of work to be done before the first court appearance. At the top of your to-do list should be contacting a criminal defense attorney, who will be your biggest ally during the legal proceedings. Keep reading to learn more about how criminal defense works and how you can find a local criminal defense attorney. Criminal lawyers examine the case against the defendant from all angles, searching for evidence that police may have missed, or for signs that the defendant was treated unfairly by the justice system. Having someone on your side who is protecting your legal rights can mean the difference between a harsh sentence and little to no penalty. If you have been informed that you will be charged with a crime, you should hire a criminal defense attorney as soon as possible - even before your arrest if time permits. If you have already been arrested, you should hire a criminal lawyer before your arraignment, which is your first appearance in court. Criminal lawyers prepare the defendant for the arraignment, which typically takes place within 48 hours of the arrest. During this crucial time, the attorney will examine evidence, speak to witnesses, negotiate bond amounts, preserve evidence left behind by police, and even argue for the defendant’s release. The steps the attorney takes before the dust has settled from the arrest could amount to shorter sentences, lesser penalties and possibly even release. If you can’t afford to hire an attorney and are facing charges that threaten to place you in jail for six months or longer, it is your legal right to have one provided to you at no cost. If you don’t fit these qualifications for free representation, you will have to pay to hire a lawyer. Keep in mind that lawyers charge more or less based on factors such as their years of experience or size of their law firm. Consultation fee - Many lawyers give free consultations, but there are some who charge a consultation fee. Contact a few local attorneys to get an idea of whether you will be charged for the initial consultation. Retainer fee - Most attorneys charge a retainer fee for you to acquire their services. The retainer fee is either a percentage of the case or, if the lawyer charges by the hour, the cost of a number of hours of work. Retainer fees can range from $2,000 to $50,000 or more based on the severity of the charges. The retainer fee is usually placed in an account, and the lawyer costs are deducted from that account until it runs dry. From then on, the client is billed for additional expenses. Some lawyers charge a flat fee for certain offenses such as DUI, so you will know upfront how much it will cost you. When speaking to an attorney, ask them about their fee structure so you get a clear picture of how much you’ll spend. Additional lawyer costs - Lawyers also bill for costs such as paralegal work, travel expenses, photocopies and research. Be aware of these potential costs so they don’t come as a surprise on your total bill. Court fees - The court will sometimes charge fees that you will have to pay in addition to lawyer’s fees. These court fees can include filing costs, bailiff costs, service of process fees, jail fees and more. Fees for expert witnesses - Expert witnesses and investigators charge for their services, and the cost is passed on to the defendant. Expert witnesses’ rates can range from hundreds to thousands of dollars depending on their specialty and level of involvement. How Can I Find A Trusted Local Criminal Defense Attorney? AboutBail has a nationwide trusted network of local, qualified criminal defense lawyers. The quick search will provide you with contact information for criminal defense attorneys near you. Use that information to get in touch with a lawyer near you to find out more about the firm’s services and costs. 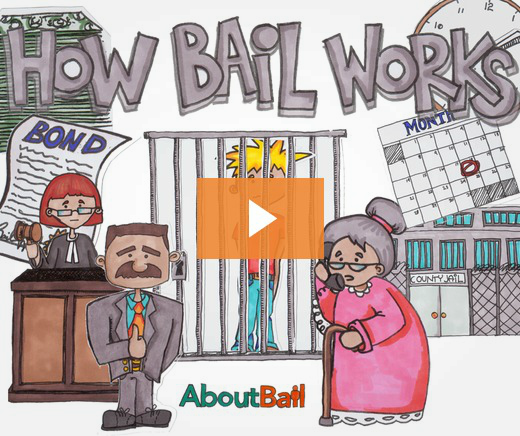 Watch our video above for an explanation of the bail bond process. Learn more about how bail works. Bail cost varies from state to state because of different statutes and regulations. Find out how much it costs in your state.